By the time he got to the Martin Luther King Jr. Student Union to begin prepping for the event at 5:30 p.m., a throng of students and other demonstrators flanked the building. As he walked through the crowd, protesters surrounded him and closed in on him, pushing and shoving him from all sides. “We know who you are, you can’t hide from us,” Tahmas recalls them saying as he pushed through the crowd. Rattled but essentially unharmed, he made it into the building. 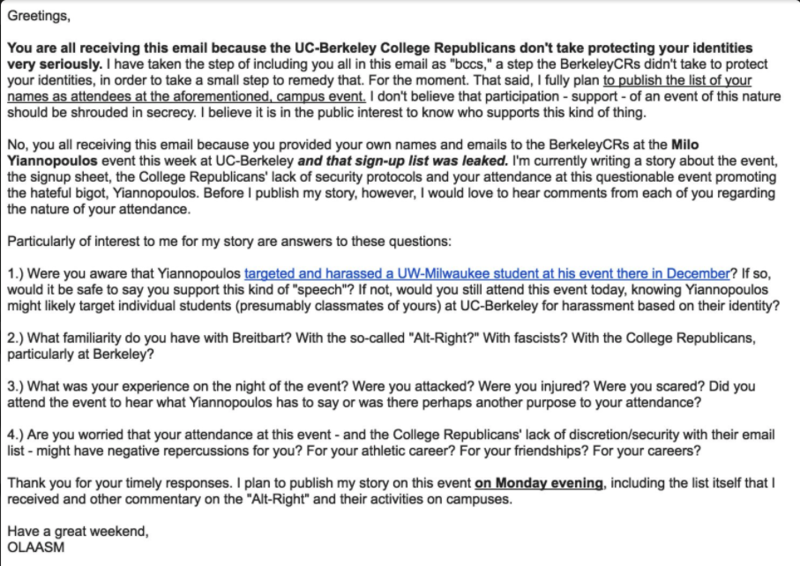 There he met up with Yiannopolous and other Berkeley Republicans. But it was not long before someone pulled the fire alarm. Then protesters began shooting M-80 firecrackers at the building, with several narrowly missing the group and the police officers attempting to guard them. Don’t you just love the fact that someone who can write “I don’t believe attendance – support – of an event of this nature should be shrouded in secrecy. I believe it is in the public interest to know who supports this kind of thing” is, naturally, anonymous? As I pointed out the other day – like the original Brownshirts and Blackshirts, this sort of thing is intended to drive everyone to the extreme, to empty out the center. And at this exact moment, reading this story, it’s working. I want Milo to come to the U of M, and I want to gather up a few hundred people who actually support free speech, and meet these cowards face to face and rip their ofay little facemasks off. It’ll pass in an hour. This entry was posted in Liberal Tyranny, Urban Progressive Privilege by Mitch Berg. Bookmark the permalink. Notice the sackless little punk that wrote the message didn’t put his name to it. I’d gladly donate to get Milo up to the UofM. Hell, I’d be willing to get him into Clemson, but he’d be greeted with Roman salutes and slaps on the back…what’s the fun in that? My big regret is that the “Black Student Union” wasn’t holding a reception in honor of “Black History Month” when the little fascist thugs decided to break all the glass in the MLK building. Now that would have been entertainment! Rioting is a felony charge. Why do they carry cellphones and have facebook accounts, if they can be used as investigative tools and possibly evidence against them? Because that is how they organize the riots. It is a conspiracy to deprive people of their civil rights. We are not talking about spontaneous acts of violence. Better yet, jail the source of the money that feeds the beast. Bingo. Facebook is a coppers dream. Every time some chuzzlewit shoots it out with another chuzzlewit, first thing the cops do is Facebook and viola! There’s our guy, fanning money with a nine tucked into his drooping pants. If you Facebook, first of all, don’t, but if you do, remember that your timeline, your friends list, your “likes” & etc., could and would be used as a prosecutors Power Point presentation against you. The only reason they aren’t being jailed is the leftwing idiots that run these cities and schools. My gut tells me that the time isn’t far off before things really go sideways for these anarchists. If you get Milo to come, I’ll donate and attend. 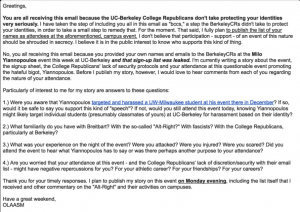 Is the Milwaukee incident he links to the one with Triggly Puff, or was that Shapiro?